This entry was posted on May 29, 2012 by Robyn Lee. 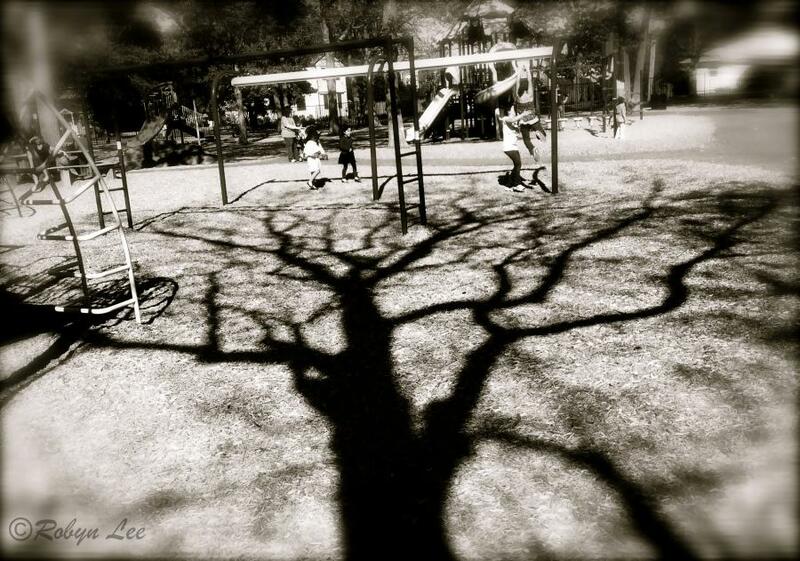 It was filed under Spring 2012 and was tagged with childhood, energy, healing, innocence, joy, Love, moments, mystical, nature, peace, photography, play, playground, protection, puerility, Robyn Lee, source, spirit, tree, youth. I love these shadows you’ve been taking very creative. what can i say, i just love your work! I believe you have a specialty in finding the perfect shade and artistic, RL, wonderful your post tonight, simple but great. Nandini – so appreciate your ‘Ooooh” – I say that ALL the time too!! So glad you enjoyed this ~ sending good thoughts your way this evening! India – how glorious!! Good Morning to you Nandini! Yes that it is! 😀 Thank you for your wishes. to you too! Oh Lady Day – you are too wonderful to me. Thank you so much for loving this. It’s a favorite of mine as well… So appreciate! Fantastic photograph and brilliant word – had really got me thinking – thank you Robyn! Perfect words for a great photo. Yes, this shadow is provacative….like the way it stretches toward them…good eye here Robyn!!!! I didn’t even see the shadow of the tree at first. Very interesting. I learned a new word for the day! Thanks for enlightening me! This has almost a nostalgic feel, which goes so wonderfully with your words! Enjoy your day! 🙂 Yes Puerility – cool word ~ whimsical and childish… thought it fit this 🙂 There is such a wonderful thing about the child’s untainted spirit. Should be protected (as this wonderful tree seems to be doing). I am so glad you enjoyed… Yes, I agree, nostalgic in many ways… this one really unfolded so easily. I love when that happens. Sending Love your way today KT!!! Shadows are proof of light. They do not exist in the dark.